Cukunft Jewish Association is a young non-governmental organization established in 2014 and officially registered in January 2015 Registration No. 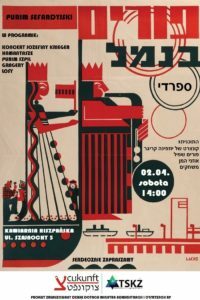 (KRS): 0000538922 by a group of young Polish Jews with a purpose of educating and integrating people of Jewish origin within Polish and European civil society as well as combating Discrimination, Antisemitism, xenophobia andall forms of social exclusion. We launched Cukunft Jewish Association by organizing Rosh Hashanah Seder in September 2014 attended by 26 Jewish community members, aged 2-70. In October 2014, we started our first flagship projects – Jewish Cultural Club (JCC Wroclaw www.jccwroclaw.pl), a monthly ongoing outing taking members of Jewish community to the cinema, theatre, opera, art exhibitions, concerts, trips to the ZOO attended by between 20 to 30 people on average. In October 2014, we also launched “Bis a120!,” a project of celebrating birthdays of members of our Jewish community and, Hasmonea Jewish Sports Club that helps to integrate all members of the Jewish community via sports activities and recreation. In November 2014, we organized the First Tzedakah Day (Jewish Charity), during which we collected winter clothes, detergents, food and money for many needy members of Lower Silesian Jewish community, aged 4 to 96. We repeated the event in November 2015 by collecting goods and money for Ukrainian and Syrian Refugees living in Serbian Refugee Camps in cooperation with Wroclaw Welcome Refugees Coalition. JCC Krakow, JCC Warsaw and Mitzvah Day 365 UK. 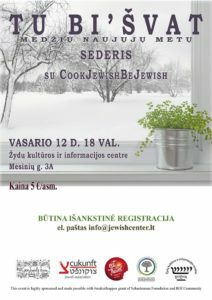 2) #CookJewishBeJewish summer camp in Lithuania teaching Jews from Europe and Israel how to cook traditional Jewish cuisine of Litvaks and Galizianers as a part of ROI Community Grassroot for Laurina Todesaite (Eat&Travel) and Aleksandra Wilczura (Cukunft). 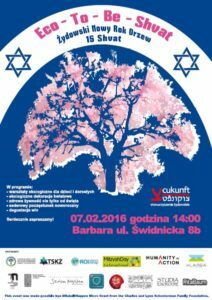 3) “Together Against Hate” Coalition weekend seminars in Warsaw, Lublin and Bialystok. 5) Wroclaw Welcome Refugees Coalition. 6) Hasmonea Sports Activities – kayaki and chess trainings for all age groups. 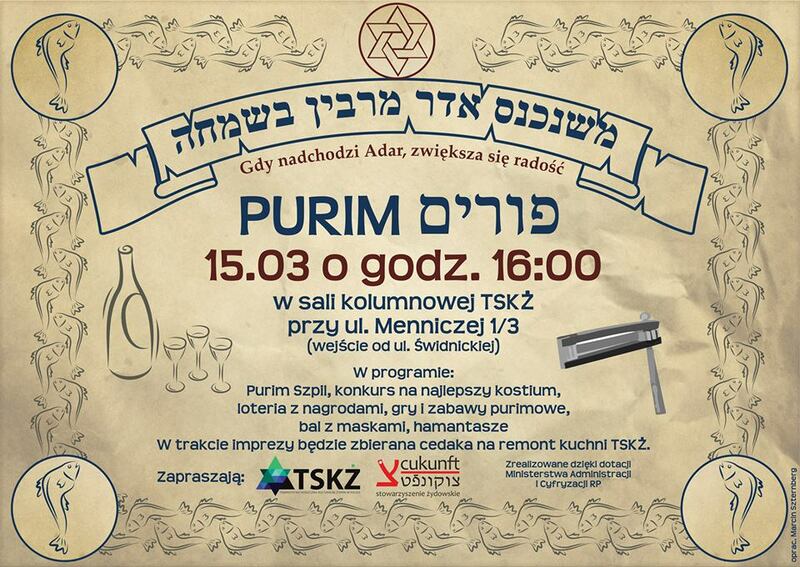 7) Rosh Hashana Celebration with Socio-Cultural Association of Jews in Poland (TSKZ). 8) LGBTQ Festival of Equal Rights in Wroclaw. 9) Shabbaton in Lodz with Jewish Community of Lodz, Gdansk, Warsaw. 10) Lectures on Jewish culture, Antisemitism and Holocaust at Protestant University of the Third Age. 11) 2nd Tzedakah Day as a part of International Mitzvah Day – cooperation with Mitzvah Day 365 UK. 12) Chanuka Family Party with TSKZ. 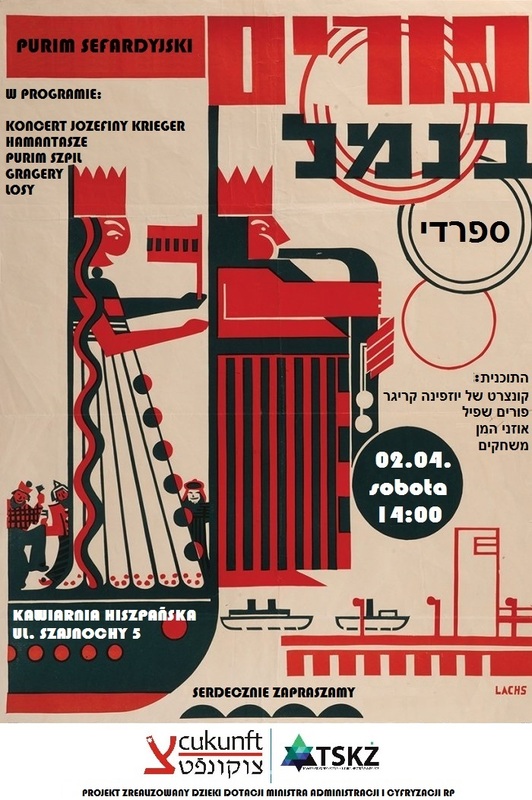 13) “Jewish Wroclaw on a Plate – Jewish Secular Culture Live!” Project, a series of lectures on modern Jewish culture, theatre, art, Jewish cuisine workshops and Hebrew and Yiddish lessons supported by FIO Male Inicjatywy Wroclaw Municipal Grant. 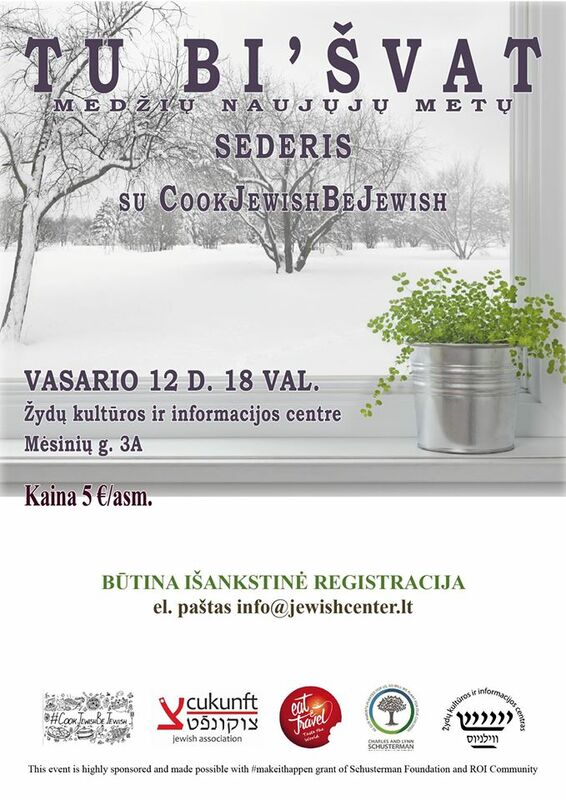 1) #CookJewishBeJewish Tubi Shvat Seder 2016 in Vilnius – cooperation with Eat&Travel. 2) Eco-To-Be Tubi Shvat 2016 in Wroclaw. 3) Sefardic Purim Party in Wroclaw. 4) Wroclaw Commemoration of 73. 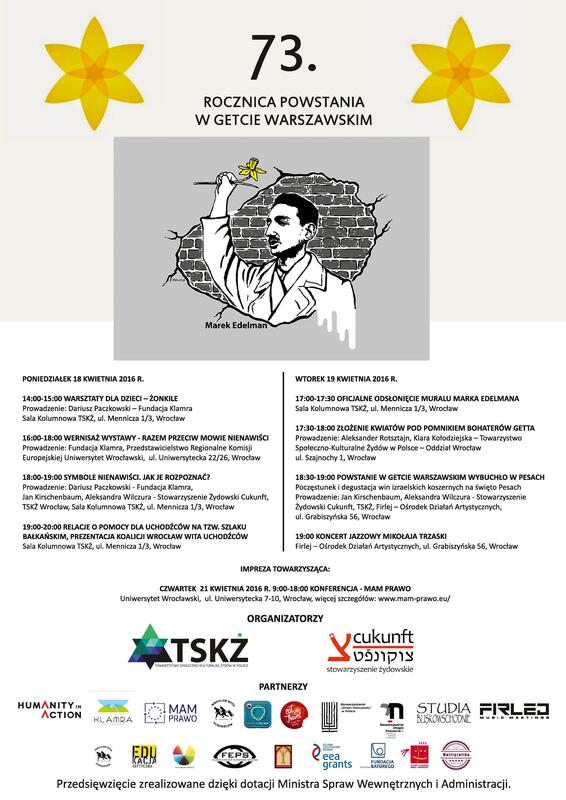 Anniversary of Warsaw Ghetto Uprising by lectures, workshops, free jazz concert of Mikolaj Trzaska and a historical mural of Marek Edelman thanks to Humanity in Action. 5) #CookJewishBeJewish Pesach Seder 2016 in Vilnius – cooperation with Eat&Travel. 6) “Together Against Hate” Educational Exhibition in Poland – cooperation UE Commusion. 7) Film about Cukunft’s work – Cukunft Means Future – Jewish Leaders in Action supported by ROI Community. 8) Wandering Home-Made Pesach Seder Project supported by Minyanim and Jewish Agency. 9) Weekly Hasmonea Sports Activities – Basketball, Valleyball, Football trainings for all age groups. Lectures on Jewish culture, Antisemitism and Holocaust at Protestant University of the Third Age. 10) Shavout Picnic for Maccabi-Hasmonea Jewish Sports Club members that is led by Cukunft. 11) Jewish during the Picnic of Kalejdoskop Kultur in Wroclaw. 13) Shabbaton in Lodz with Maccabi-Hasmonea Sports Activities – July 22-24, 2016. 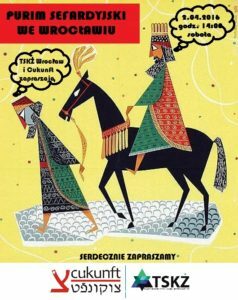 14) Zukunft-Cukunft – Breslauers and Jewish Wroclawians Exhibition thanks to grant of Roza Luxembourg Foundation – September 2016. 15) Festival of Equal Rights – Israeli LGBT Good Practices – cooperation Israeli Embassy in Poland. 16) Rosh Hashana Celebration – September 2016. 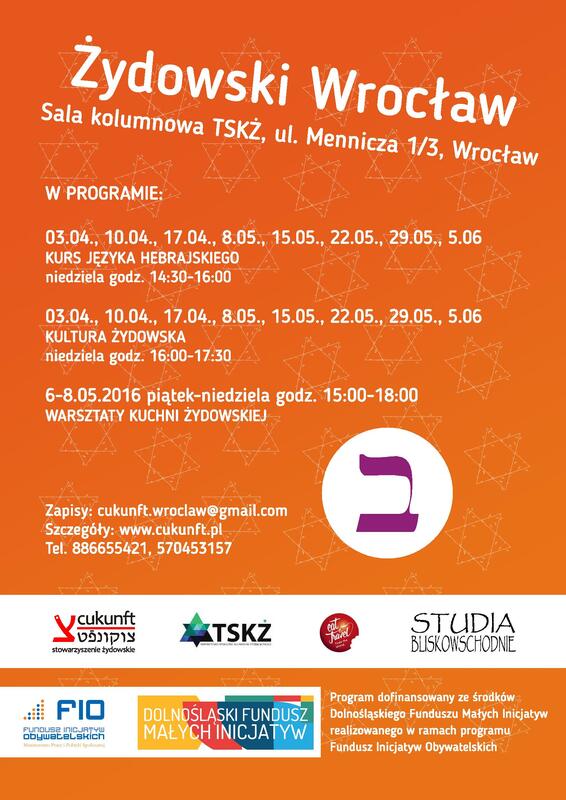 18) 3rd Tzedakah Day in Wroclaw – cooperation with Mitzvah Day 365 UK. – November 22, 2016. 19) Chanuka Family Party – December 2016.
opening Gan Shalom Jewish kindergarten (Paideia Incubator 2015). 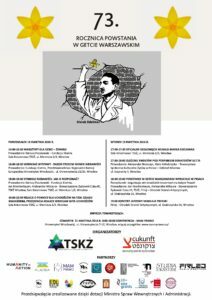 Establishing New Jewish Amatour Theatre in Wroclaw and Jewish theatre workshops and shows. Development of Jewish Sports Education and teams of Maccabi-Hasmonea led by Cukunft. Continue marking Jewish contribution to the history of Poland by unveiling artistic murals of prominent Polish Jewish figures in Wroclaw’s urban space. Development of Anti-discrimination educational program for children, youth and adults. As members of Cukunft’s Jewish Association we believe in importance and need of contemporary Jewish contribution to the local, national and European non-Jewish societies. By all our projects we mark the contemporary secular Jewish Presence by open and inclusive education, cultural and social events in the Polish and European Public Space.